צד אחד דמותה של מלכת אליזבת' השניה והמילים"Elizabeth II Australia 8 Dollars 5 oz 999 Silver 2018"
דמותה של מלכת אליזבת' השניה והמילים"Elizabeth II Australia 8 Dollars 5 oz 999 Silver 2018"
מטבע כסף הטבעת פרת' שנה לונרית של הכלב משנת 2018 משקל 5 אונקיות Make your 5 oz 2018 Perth mint lunar year of the dog silver coin purchase from our online shop today for an unbeatable price. The dog is the 11th animal in the 12 year Chinese lunar calendar cycle, the yearly symbols of which are aptly celebrated by the Perth mint lunar series II coins. The reverse of the 5 oz 99.99% pure silver coin features the iconic German Shepherd breed and shows a mother at rest in a grassy field with her offspring. Also visible on the reverse, the peony flower, a powerful symbol of prosperity in Chinese lore; as well as the Chinese character for ‘dog and the ‘Year of the Dog’ title. The coin’s obverse features an effigy of Queen Elizabeth II, as designed by Ian Rank-Broadley. Encircling the obverse imagery, inscriptions with the coin’s face value, weight and purity as well as the year of release. Because the Chinese Zodiacal animals are also associated with individuals according to the year of their birth, they are in high demand as thoughtful and favored gifts to be given on birthdays and special occasions. 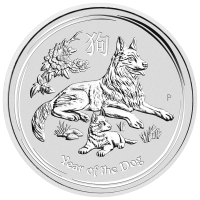 Buy your 5 oz 2018 Perth mint lunar year of the dog silver coin today, whether to add to your growing collection or pass on to loved one who bears the same sign.